With the start of Summer right around the corner, it’s important to know how to properly care for your pet in the heat. Along with Summer often comes outdoor activities, beach outings, and more fun with your furry friend! It’s important to keep in mind, however, that Summertime comes along with some extra precautions you should take when caring for your animal. 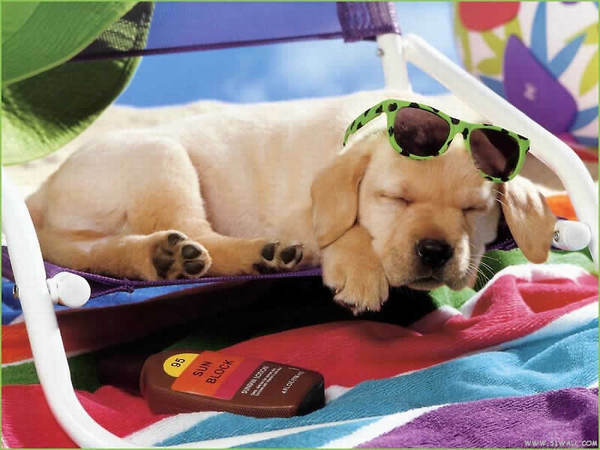 We’ve outlined a few tips to help you and your pet have an awesome summer! 1. DO NOT leave your pet in the car. Even with the windows cracked, the car can reach extremely hot temperatures in only a matter of minutes. This makes your dog more likely to become dehydrated or suffer from overheating. Although Fido may love to ride, you should only bring him along if you are going somewhere that he can go too. Even if you think you will only be in the store for a few minutes, your dog should never be left alone in a hot car because unexpected events do happen, and you may be gone longer than you planned. 2. Keep water available to your animal at all times. Never let your pet’s water bowl go empty during the summer, especially if he stays outside. It is important to keep an ample water supply available to your animal at all times to ensure he is properly hydrated. If possible, add ice cubes to your pet’s water to help keep him hydrated and cool. He will likely enjoy this little treat! We all know it’s important for your dog to get exercise, but on especially hot days it’s best to limit exercise to the early morning or evening. If you must walk your dog during the heat of the day, be sure to take water and stay on grass as asphalt can get very hot and burn his paws. Note: Be careful with your white pets, who are more susceptible to skin cancer, and short-nosed pets, who may have more trouble breathing. 4. Make your furry friend some doggies popsicles! Everyone loves spoiling their fur babies, so be sure to try out the recipe below! In a small mixing bowl, combine ingredients until desired consistency is reached. Line a cookie sheet with wax paper, and drop the mixture onto the tray (similarly to how you would with cookie dough). Freeze overnight. Serve, and make some happy puppies! Tip: You can make popsicles out of anything your dog would normally eat, so experiment with various recipes to see what he likes best!